This is the technical cork 1+1. It's name arrives from the natural cork disc on each end of the cork. The body is made of granulate cork. They are used for wines that are not intend to age in the bottle and fruity wines. 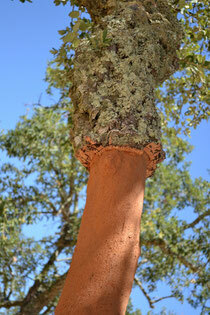 The champagne cork usually has a body of agglomerate cork and has one shaped end and one end with natural cork disks. It will provide an easy bottling and great behavior. There is the option of not using the natural disks so that it will reduce costs; only applicable for immediate use sparkling wines and champagnes.